Let’s now proceed to our fifth pentatonic blues scale lesson. The G pentatonic blues scale. The root note here is the G, which is obvious. And the blue note is C#. You start by playing the G note on the 3rd fret of the E6 string and work your way up to the end of this pattern which is the open G3 string. The pattern is really simple so there’s not much more I can say about it. Now let’s take a look at something a little more interesting. Here’s another pattern. 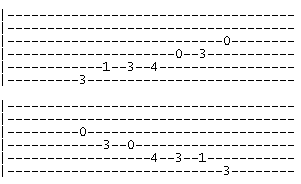 You start by playing the G note on the 10th fret of the A5 string and then go through two octaves until you reach the finishing G sound on the 15th fret of the E1 string. This pattern is better for practicing than the standard one because it forces you to stretch your fingers a little bit and also, it’s easily transferable on the fretboard. There’s more. If you want to get some visual guidance check out this video for yet another pattern of the G pentatonic blues scale. If you want to learn more you can visit all-guitar-chords.com and get the full pattern for the G pentatonic blues scale (click here).